It’s a testament to the hugely successful Marvel Cinematic Universe (MCU) that Avengers: Infinity War – the 19th entry in the decade long series has been highly anticipated ever since the first Avengers movie (Avengers Assemble, 2012). After the rather serious and instalment in Avengers: Age of Ultron (2015) the humour is back for the third film in the Avengers series. Thanos is the latest and greatest of the foes to face our heroes, having been teased in several of the MCU films to date and he brings with him what appears at face value to be a standard James Bond style villainous plot on a universe size scale – and one which it’s difficult to avoid spoilers but I will attempt to keep things vague. Thano’s plot threatens the universe, and after some exposition which explains why he needs to attack Earth first, we have the biggest assembly of Marvel super heroes to date throughout the entire MCU all set to try and stop him. The stakes are high and it’s well known that some of our stellar cast of Avengers won’t make it out alive. The purple Titan isn’t some two dimensional bad guy, though, he is given a substantial amount of character building wrapped in plenty of pathos as we see his motivations through. A good move as Marvel’s villains are usually weakly drawn and this pays off in spades throughout the lengthy running time. The sheer size of the multi-film narrative has been generally effectively translated into what seems like the best action bits from the middle of a longer mini-series. And the writers have done their best to give people unfamiliar with the series a way to enjoy what they see without getting too confused despite at times seeming like a runaway rollercoaster. 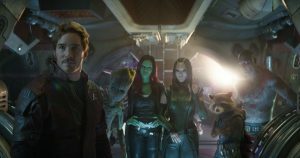 Rather than feeling overly long, though, there’s so much going on that it’s inevitable that Infinity War boils down into a set of vignettes that dovetail between several groupings of our heroes as they try to repel Thanos’ quest to gather enough power by capturing Infinity Stones – ancient objects of power – which will enable him to carry out his mad plans. These groups each carry their own dynamics, with Robert Downey Jr’s portrayal of Tony Stark’s story arguably one of the most compelling but I should give a shout out to the comedic interactions of Thor (Chris Hemsworth) and Peter Quill (Chris Pratt) alongside Doctor Strange (Benedict Cumberbatch) and Spider-Man (Tom Holland) and while there’s also a bit of romance in this film between some of the characters things start to feel a bit repetitive by the end, and you can see the bits where it doesn’t quite join up if you stop to think about it. Sadly, some of the other characters feel like they get the short end of the stick, and while Chadwick Bosemen’s Black Panther has only just appeared in pretty much the biggest Marvel film to date (until Infinity War’s figures are calculated) his (large) group isn’t as compelling as the smaller, emotional and more personal stories that thread their way through this film. It’s inevitable that fans of the Marvel series will enjoy Infinity War more than most – it gives off a vibe not unlike that of The Empire Strikes Back (1980) – an important part of a greater story that will have fans looking to come back for more. The next Avengers film is just a year away and there’s more from the Marvel juggernaut later this year and early next year – with one film teased nicely at the very end of the end credits. Summary: AVENGERS: INFINITY WAR is a US fantasy film in which an army of superheros must work together to stop an evil foe from destroying the universe. This entry was posted in Shooting The Breeze and tagged Avengers Infinity War, film review. Bookmark the permalink.